Unfortunately, you did not become a pediatrician as you had always hoped to become, and that’s ok. You are not a failure. God had a different plan for you. Just embrace it and keep pushing. If I could have forewarned you, I would have told you to NOT take 8 classes the first semester of your freshman year. At UC Berkeley. College isn’t high school. Never let that ambition and drive you have diminish or disappear. You will always need it, and you must always cultivate and nourish it. 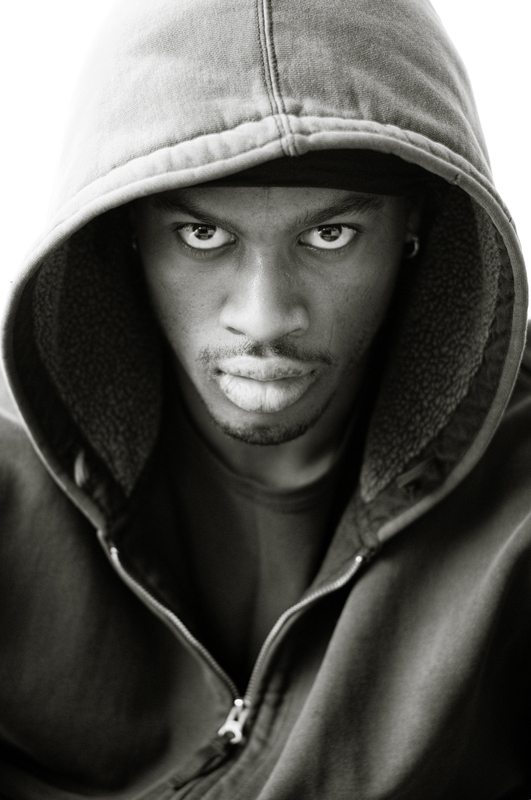 Don’t own or claim the odds that are stacked against you. They are not yours. Granny was not there in the physical sense to see you walk the stage when you got your bachelors or masters degree. But know that she was there. She will always be there. Your mom, sister, and brother are still in your corner and believe in you. So keep pushing! Life never gets any easier. And that’s also ok. Just learn from each experience and continue to self-reflect and grow. If you are fortunate to stay connected to or to reconnect with those that supported you on your journey, thank them. Thank them. Thank them. You will become a champion for the kids that were like you. Those navigating challenges and coming from communities that are often cast in a negative light. The green/inexperienced kid that may not fully understand the process, but has the desire to do better in life – for themselves, their family, and community. You will always carry a backpack. A very heavy backpack. But it’s never filled with burdens or pity. And always, always, always – stay focused and humble. Have you ever had an experience that put you on a natural high? A feeling that is so positive that it keeps you from falling asleep? An experience that motivates you to try and find a way share this feeling/moment/initiative with others? I experienced such a moment on the evening of Saturday, February 8, 2014. It began with a text from a good friend Vielka that afternoon, “Are you planning anything tonight… I may be able to get front row tickets to Sheila E tonight….” With initial plans that I had falling through, I quickly accepted Vielka’s offer. These tickets were for a the Elevate Oakland 1st Annual Benefit Concert at the Fox theater in Oakland. 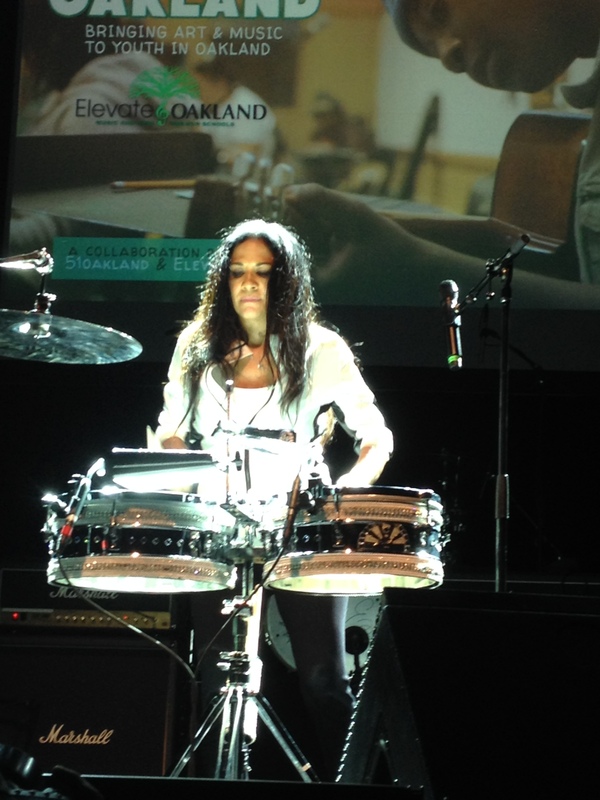 Elevate Oakland, spearheaded by Ms. Sheila E., is a collaboration between two organizations – Elevate Hope and 51Oakland – with the focus of improving academic achievement and increase student attendance by providing creative and relevant curriculums through Music and Arts Education. For this benefit concert, artists like Ozomatli, the Bay Area’s own Goapele and Michael Franti, and host of other artists and musicians donated their time and talents for to raise money for this cause. 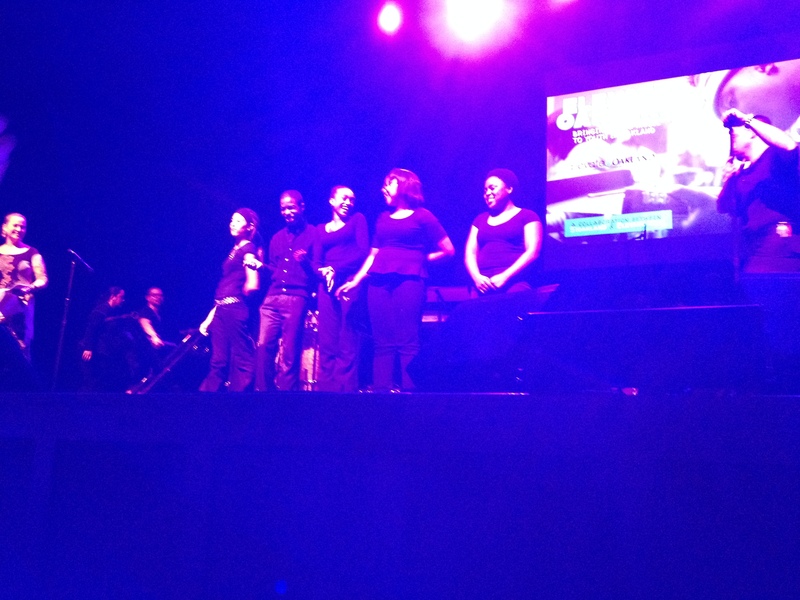 The stage was also a platform for those that this concert was benefiting – youth of Oakland who have an intense passion for music and arts – a resource that over the years has experienced a decrease in funding and support. It is hard to capture into words how elated these youth were to share their amazing talents with the world – and it’s even harder to explain how beautifully this passion is evident in every note they played and lyric they sang. As a product of the Oakland Unified School District, I remember fondly on the music programs of the schools I attended, and how much those experiences were positive forces in my life. My first music teacher was at John Marshall Elementary School, and his name was Mr. Tapiro. In the third grade, he taught us the very basics of music – how to read notes, about the legends and grandfathers of music (i.e. Beethoven, Bach, etc.). He also taught us how to play the recorder – the first tune I learned how to play was Transylvania 6-5000. He would refer to us students as his team – specifically, as his “Hoosiers.” Mr. Tapiro loved music, and did whatever he could to prepare the next generation in keeping this art alive. My next music teacher was at E. Morris Cox, and her name was Ms. Newsome. She specifically taught our 4th and 5th grade chorus classes- my favorite songs to sing were “Lift Every Voice,” and “Believe in Yourself.” With Ms. Newsome, I also learned how to play the trumpet. I can still remember the strong smell of the valve oil, and the loud clicks of the latches on the tattered brown case I would tote my instrument in. I would guard this thing with my life, and there was NO WAY I was gonna let anyone “just play” my trumpet. It was my responsibility. It was my positive outlet. It was a necessity. My last music teacher was Ms. Morrison, and she taught 7th grade chorus at King Estates Jr. High School. She would teach us about the history of music – specifically the origins of Blues, Gospel, and Soul. She could also play a mean piano. One of the songs we used to warm up our vocals with was “Do-Re-Mi,” a la “The Sound of Music” style. When Ms. Morrison would hit the break down, she would play these funky chords that had our class belting in a collective soulful “heyyyyyyyyyy!” She made music fun and engaging, something that us Oakland youth needed. But as time went on, budgets got cut – and programs that were once viewed as required became electives. And eventually these electives became almost non-existent. 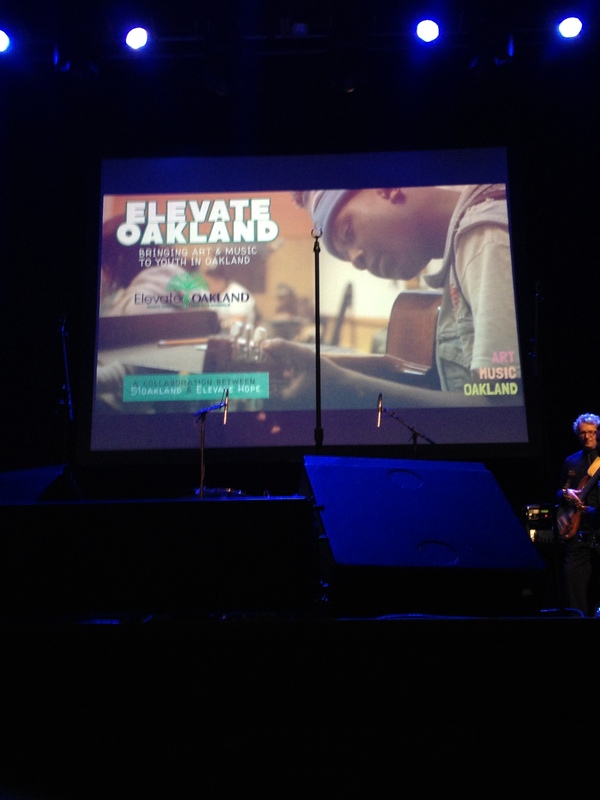 However, with initiatives like Elevate Oakland, the importance of music and arts for Oakland youth is redeveloping the recognition and respect it deserves. I am sure somewhere, teachers like Mr. Tapiro, Ms. Newsome, and Ms. Morrison are proud. 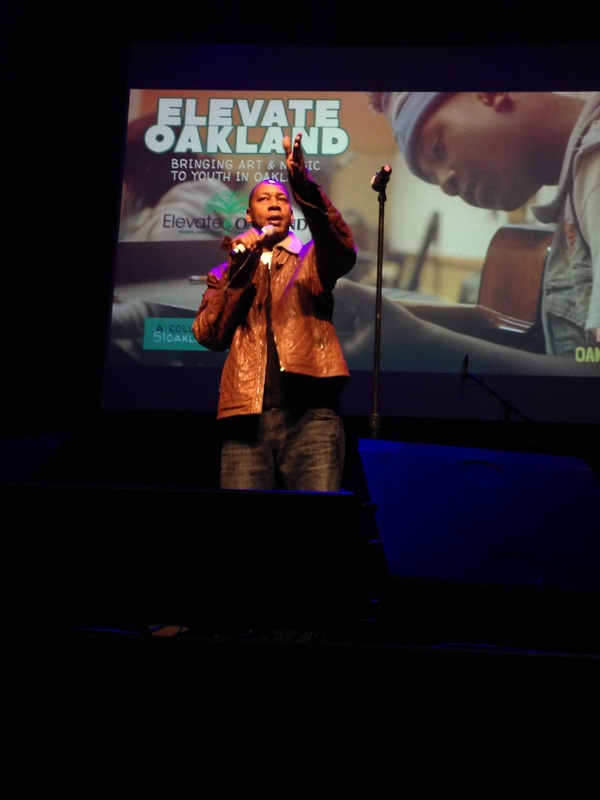 Mark Curry, comedian and Oakland native, addresses the audience and encourages the support for the Elevate Oakland Initiative. Photo by Katherine Brown. 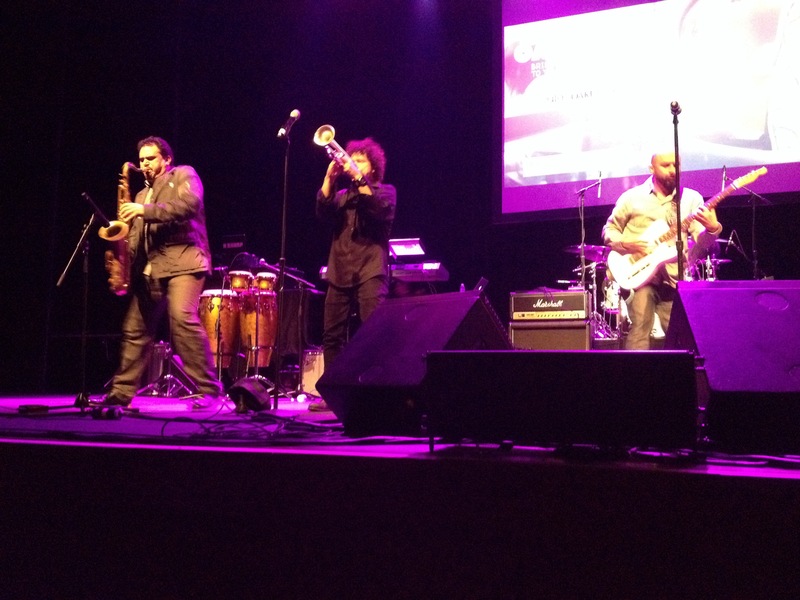 Los Angeles-based band Ozomatli donate their time and talents for this worthy cause. Photo by Katherine Brown. 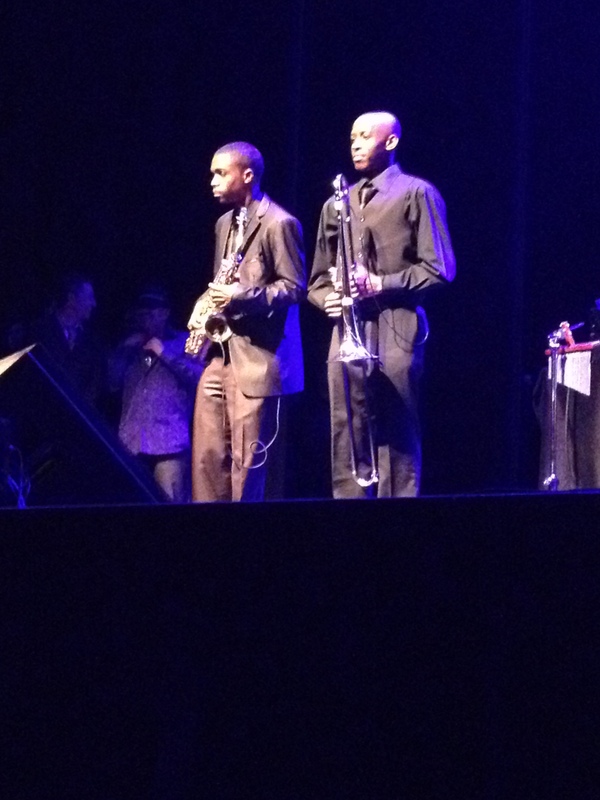 Members of the Castleers – Oakland’s Castlemont High School signing group – take in their standing ovation after their brilliant performance. Photo by Katherine Brown. 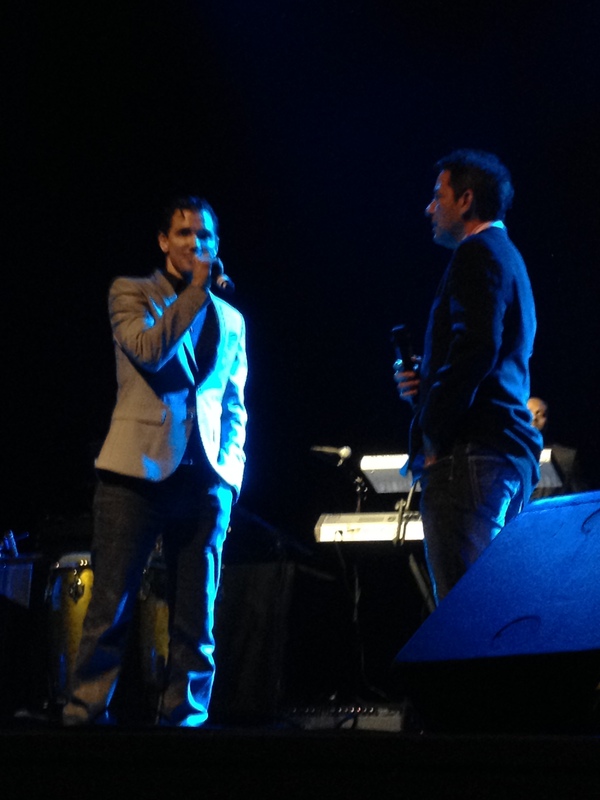 Musicians El DeBarge and Peter Michael Escovedo share why supporting youth in music and the arts is important. Photo by Katherine Brown. 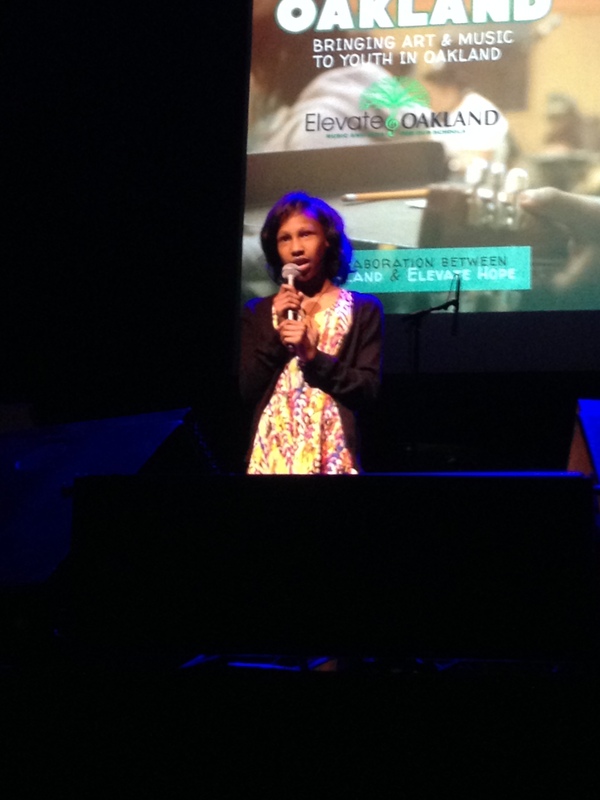 A youngster from Oakland’s Westlake Middle School performs an a cappella number for the audience. Photo by Katherine Brown. Young musicians from Oakland’s Castlemont High School set to perform with Sheila E. It’s hard to believe that these extremely talented young men are 15 and 16 years old. Photo by Katherine Brown. 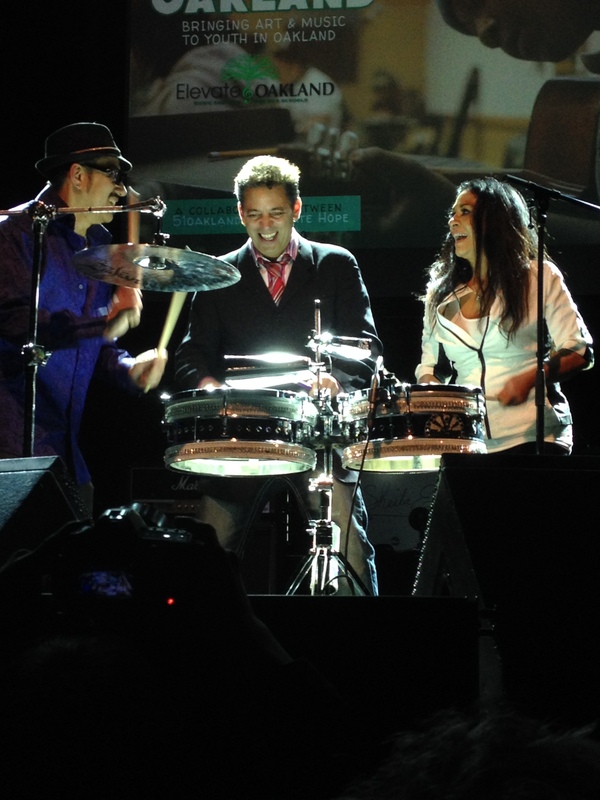 The phenomenal Sheila E. giving her heart and soul in her performance. Photo by Katherine Brown. “A family that plays together…” Siblings (l-r) Juan, Peter Michael, and Sheila Escovedo bring down the house with their percussion skills. Photo by Katherine Brown. 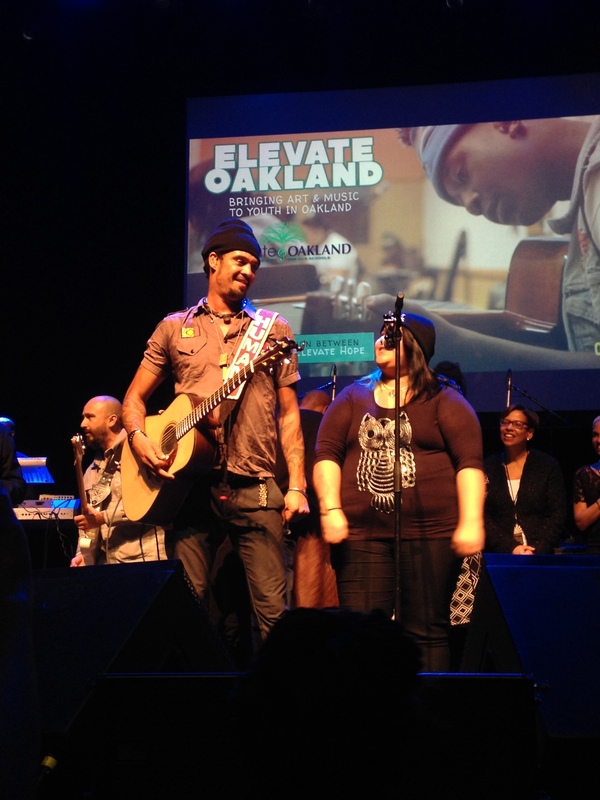 A young Oakland singer performs along side Bay Area-raised musician Michael Franti. Photo by Katherine Brown. 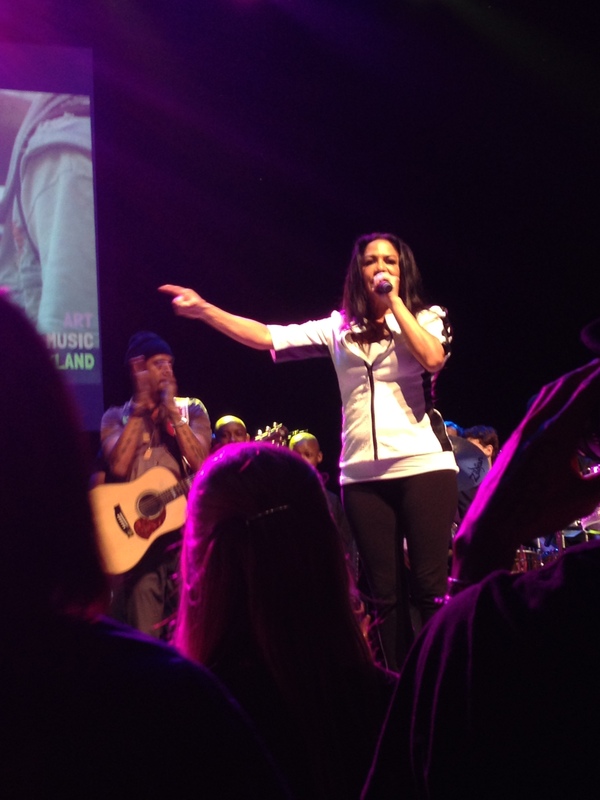 Oakland native and Grammy award winning artist, Sheila E., gives an impassioned thanks to all that contributed to this uplifting event. Photo by Katherine Brown.